Stress interferes with objectivity and clouds judgment. Research has shown that positive emotions such as hope, faith, love and laughter have a positive effect on both mental and physical health. The role of positive stress reduction strategies cannot be overestimated given today's climate of calamity. Appropriately applied Vitality Management strategies can help an individual maintain the perspective necessary for successful decision making and optimum productivity. It doesn’t matter how clever you are, how old you are, or how many qualifications you have, you can still increase your brain power. There are lots of tricks, techniques, and habits, that can help you flex your gray matter muscles getting the best out of your brain cells while improving learning and memory. This session is packed with them and it’s all fun. Communication is a skill, which carries with it an inherent paradox. It is something that most of us do effortlessly and regularly. And yet more than 80% of all companies in this country rate this as an area definitely needing improvement. Most companies go so far as to say it is a major problem. As we increasingly utilize technology to communicate, it is important to employ tools and techniques to ensure clear, effective transmission of messages. Humor's Role in an Optimistic Workplace As children, most of us looked enthusiastically ahead to the day when we would join the ranks of the employed. Now here we are at work, and many of us are not at all enthusiastic about going everyday. What makes the difference? Humor: Jest for the Health of it! Medical conditions caused by mismanaged stress and the strain associated with overwork and change are major issues for individuals and organizations. An optimistic, healthy work culture promotes optimal job performance and productivity. The fun-while-learning session is based on information from Cheryl’s book, “THE FUN FACTOR: Your Prescription for Stress at Home and at Work”. Laughter is not only good medicine, but it is also good business. There is hardly time to catch one’s breath!. How can anyone respond to the often conflicting demands in our lives when there is so much to do? Since we can’t slip back to a slower, simpler time, the only alternative is to face what comes our way, focusing our available time and energy on the things that are important and in the places where we can make a difference. Success in any work environment depends upon your ability to anticipate and adapt to change, and becoming pro-active in linking your talents, interests, and values with the changing requirements of the workplace. This session is designed to help individuals develop key competencies, enhance performance, and maximize potential for success. Some Assembly Required: Delivering Excellent Customer Service Service is equally important in private business, as well as public agencies. Customers can be internal and external. This session is designed to address handling "difficult" people, identifying employee attitudes and "hot button" issues, as well as giving tips on handling complaints effectively, showing sensitivity and managing the stress. We Can't All Be Oprah! How Do You Define Success? Cheryl has interviewed Financial Guru, David Bach; Princess Michael of Kent; The Sweet Potato Queen, Jill Connor Brown; Show Biz Royalty, Shirley MacLaine; former Speaker of the House of Representatives, Newt Gingrich; and Lady Dianna's butler, Paul Burrell. Oprah has interviewed all of these folks too. What's the difference? Find out in this tell-all session about defining success. Jingle Bells, Jangled Nerves: Handling the Holidays with Joy! 'Tis the season to be cranky? The holiday season poses challenges for us all, children and adults. New ideas for handling the stresses and strains are presented with "a spoonful of sugar" to help the holidays be a sweeter experience. This session will give you new ideas to make the holiday season fun again. "Cheryl Nason is an accomplished professional trainer. She has a unique ability to immediately connect with her audiences." "Cheryl's presentations give you not only food for thought, but nourishment for your soul...she can help you find and utilize the humor in your life. ..knowing that a smile is more healthful than a frown...what a dynamic lover of life." 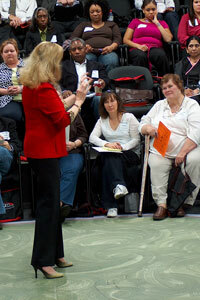 "I highly recommend Cheryl as a speaker and trainer for any event. She is an inspiring and energetic influence on the people who come in contact with her." "Cheryl treats employees at all levels of the organization with personal interest and respect. She always does a superior job. Her strength is tailoring the presentation to the needs of the audience. Her classes are always enjoyable for participants and this is reflected in the evaluations she receives - consistently scoring in the 'Excellent' category." Bring Humor, Wit and the "Fun Factor" to your next program! Cheryl Nason, M.Ed., delivers keynotes, educational sessions, and workshops for groups of 20 - 3000, and consistently receives high marks. She is a master of combining education and entertainment, which makes for highly enlightening, enjoyable presentations. TV/Radio experience gives Cheryl the edge in her presentations. 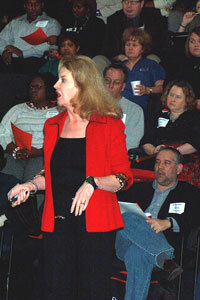 Quick on her feet, she adjusts easily to her audiences and typically receives high marks in session evaluations.